Every seat is filled, and more stand outside in the evening chill to hear those in favor of and opposed to Measure B make their case. “We’re going to try and get into the weeds — no pun intended,” said Jeff Cunan, the evening’s moderator, as interested members of the public gathered to learn more about commercial cannabis and Measure B. 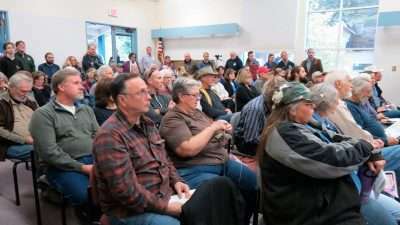 There wasn’t a seat to be had as area residents gathered to hear the proponents and opponents of Measure B in the Quincy Library meeting room on Wednesday evening, Oct. 10. 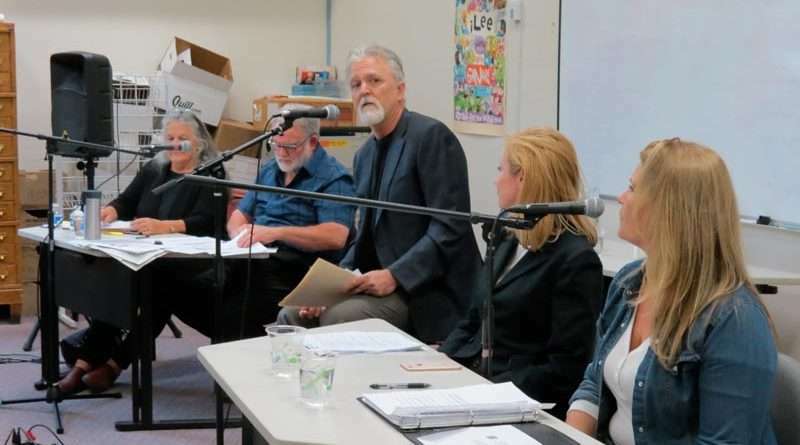 The event, hosted by the Plumas Action Network, featured 90 minutes of statements and audience questions, moderated by Cunan, the county’s former district attorney. The co-authors of Measure B, Chelsea Bunch and Kim Scott, sat on one side of Cunan, while those speaking for the opposition, Sharon Covington and Bill Martin representing the Cannabis Citizens Group, sat on the opposite side. She said the last topic she wanted to address in her opening was environmental impacts. “Measure B does not exempt itself from CEQA oversight,” she said, which is the California Environmental Quality Act. She said that if the state didn’t accept this, then the cost of the report would be on the grower, not the county. But he said that even if they weren’t opposed to commercial cannabis, they would still oppose Measure B for several reasons: It’s not just about cultivation and includes manufacturing, distribution and retail outlets that would impact environment, tourism, crime rate, and social services; it alters zoning; and it is a county administrative nightmare because of loopholes and confusing definitions that could invite lawsuits. “Measure B is unworkable, unconstitutional and unfair to priority growers,” Martin said. He said it was unconstitutional because it favors priority residents over other. “This is a clear violation of our 14th Amendment rights to equal protection under our laws,” he said. He questioned the specificity of the definition of a priority resident as well as the license requirements. Martin also used the opening statement to question how the county could reap its tax revenue when cannabis businesses self report and operate in cash only. Not only did he question the ability to collect taxes, but he warned that commercial cannabis would cost the county with the need to administer the ordinance defined by Measure B.
Martin also discussed jobs. “Measure B promises new jobs without explaining how legally required federal withholding for income tax, Social Security and Medicare would be handled by cash-only businesses that cannot legally use banks,” he said. What recourse does a landowner have with a cannabis grow next door? Bunch said that all facets of a cannabis grow would be subject to regulation and cited odor control and setbacks as examples. Fellow proponent Scott said that residents who experienced issues could contact the proper authority or the sheriff. In this forum, the speakers had the opportunity for rebuttals and Scott said that the “only people that would be exempt are those who already grow” and Bunch told those gathered that no cannabis grows would be allowed in residential areas. Covington countered that people also live in rural and suburban areas, where neighbors would be allowed to grow. And Martin addressed the assertion that those with complaints could simply call the appropriate authority, such as the state water board in Sacramento. What would happen if Measure B doesn’t pass? Bunch said there are a number of populations reliant on medical marijuana — such as veterans with PTSD, children and cancer victims —that wouldn’t have local access. “They would have to drive three hours to Sacramento,” she said. Scott addressed the need for the jobs that Measure B would produce. “It’s a great opportunity to start a new industry,” she said. Martin addressed Bunch’s assertion by saying, “They claim there’s a great lineup of people who need cannabis.” He said that those people seem to be having their needs met from outside deliveries and that there are people on their group’s opposition list who use it medicinally. Covington said that Measure B as written, is “incredibly convoluted” and if it doesn’t pass, expects that there will be future endeavors to craft another measure. She said that she would like the board of supervisors to work with the planning department to develop an ordinance. “An attorney worked on this for four months,” Bunch said. Measure B requires growers to pay taxes. How will the county be able to accurately collect them? Martin questioned how the county would collect the taxes since commercial cannabis is an all cash business that can’t deposit in banks. Scott said, “The state has seed-to sale-tracking.” She also addressed the banking issue by noting that “credit unions can work with cannabis activities” and that many do. Bunch said that when the process began back in 2016, they were told something would be in place, but when it wasn’t, they drafted their own measure. How will it affect crime? Can you provide statistics? Will the sheriff need to hire more deputies? Martin questioned the Colorado figures quoted by Bunch, saying that according to a study he read, crime overall increased by 11 percent and violent crime increased by 18 percent since the inception of commercial cannabis. Covington used the question to discuss the proponents’ assertion that the industry would create needed jobs. “Jobs are available in Plumas County; just can’t find people who are willing to work,” she said. She added that seasonal pickers wouldn’t solve the job issue in Plumas. What are the potential environmental impacts of cannabis production? Covington said that the crop requires high uses of water and fertilizer. Martin, who serves on the local water board, worried about what would happen if toxins infiltrated the water supply. “We wouldn’t be able to do anything,” he said. They both worried that entities wouldn’t be able to monitor the possible abuses. Bunch described cannabis as one of the most highly regulated industries. Priority residents. What is that? May that be deemed unconstitutional? “A priority resident is someone here before 2016, identified by the state, who has been paying taxes,” Scott said. The priority resident is limited to 10 percent of the licenses awarded in the first year. Martin said that the priority residents would be given rights that a non-resident wouldn’t have, which would result in lawsuits. Scott said that there is a severability clause in the measure, which would allow a portion of the measure to be removed while the rest could stand. Scott also mentioned the 50 cultivation licenses under Measure B. “Yes,” said Covington. “The ordinance had to be accepted exactly as is.” The only way to change it is by another ballot process. Martin said to avoid that situation, voters should turn down the measure, and then the board could work with the planning department where three ordinances are waiting to be considered. “When things aren’t defined clearly, you end up in court,” Martin responded. If Measure B fails, what would be the status of medical marijuana? Those opposed to Measure B say that it would be as it is now. Individuals could grow up to six plants or become part of a cooperative of caregivers and obtain what they need that in that manner. Covington said she has friends who grow medically and they maintain that two plants are enough to meet their needs. Scott said that the ability to grow cannabis doesn’t meet everyone’s needs. For example some people need oil and that involves manufacturing. “Measure B returns medical rights to the people,” Scott said. What is the long-term effect of Measure B? What will it look like in 2029? What’s your most compelling reason for Measure B? “Accessibility. Restrictions. Jobs,” said Bunch. Scott echoed that by saying that she has young adult children who don’t live out of the county because of a lack of job opportunities. “I want to see a prosperous Plumas County in 2029,” she said. Bunch cited her four main goals with Measure B: accessibility, revenue, job creation and children. As for accessibility, she doesn’t want people to have to drive to Reno or Sacramento for their cannabis needs. Commercial cannabis will bring revenue to the county, which will allow it to expand its social services programs. As for jobs, “I can’t stress this enough, the work force is struggling to find work,” she said. In his closing remarks, Martin took issue with Measure B proponents claiming it was a local effort, since most of their campaign materials were purchased out of county and 50 percent of their campaign funds have come from one out-of-the-county contributor. He also reiterated points made earlier in the forum, that commercial cannabis would be allowed in rural residential zones and in all suburban zones, there would be more illegal grows and the propensity for lawsuits. “There are many problems with this ordinance,” he said and cited the bypassing of landowner rights, the elimination of environmental safeguards, and no way to alter provisions of the measure if it passes.